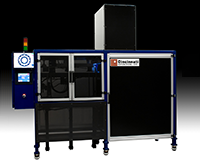 This Automated Inspection System was designed to be used for over 40 part numbers of compression springs from 4" up to 10" OD. Some springs had ID teeth, some OD teeth and others had smooth edges. Springs were loaded in three 18" high stacks with automatic stepper motor height controls. Three 3-finger grippers were used to pick springs from tops of stacks and to place springs on the inspection conveyor. A high resolution Keyence vision camera system was installed above an LED backlight area for precise inspection/gaging of spring features. Good parts were dropped down a chute to customer bins. Rejected springs were ejected inside of the cabinet into an internal container. Machine status and functions were displayed on an 8" color touch screen HMI. An AB micrologix PLC controlled all machine operations.